Definition at line 85 of file MachineRegionInfo.h. Definition at line 77 of file MachineRegionInfo.cpp. References llvm::PassRegistry::getPassRegistry(), llvm::initializeMachineRegionInfoPassPass(), and ~MachineRegionInfoPass(). Definition at line 122 of file MachineRegionInfo.cpp. References llvm::RegionInfoBase< Tr >::dump(), and ID. Definition at line 109 of file MachineRegionInfo.cpp. Definition at line 94 of file MachineRegionInfo.h. 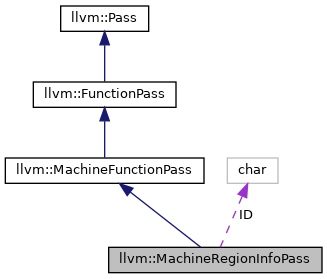 Referenced by llvm::GraphTraits< MachineRegionInfoPass * >::getEntryNode(), llvm::GraphTraits< MachineRegionInfoPass * >::nodes_begin(), and llvm::GraphTraits< MachineRegionInfoPass * >::nodes_end(). Definition at line 96 of file MachineRegionInfo.h. References llvm::dump(), F(), and print(). Definition at line 117 of file MachineRegionInfo.cpp. Definition at line 97 of file MachineRegionInfo.cpp. Definition at line 83 of file MachineRegionInfo.cpp. References llvm::RegionInfoBase< Tr >::dump(), LLVM_DEBUG, llvm::MachineRegionInfo::recalculate(), and releaseMemory(). Definition at line 101 of file MachineRegionInfo.cpp. References llvm::RegionInfoBase< Tr >::verifyAnalysis(), and llvm::RegionInfoBase< RegionTraits< MachineFunction > >::VerifyRegionInfo. Definition at line 89 of file MachineRegionInfo.h.